Available in other different designs and sizes. Being one of the trusted firms in the industry, we are highly engaged in providing a unique range of Round Glass Fruit Bowl. We offer high quality of fruit bowls. Description : Serve fresh fruits splendidly in front of guests through these glass & brass fruit bowls, that are put on the upward lifted trunk of abstract elephants. 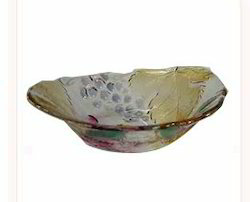 We are one of the reputed companies that supply an extensive range of Glass Fruit Bowl all over the India. Features: Non lead crystal,CE/EU certified,Smooth rims,Elegant looks. We are renowned name in the market creating world class array of Noritazeh Glass Fruit Bowls at affordable rates. We are remarkable enterprise, involved in offering superior quality Glass Fruit Set. 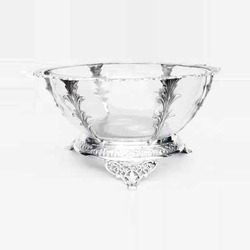 An exquisite glass platter with silver plated stand in middle to keep fruits, chocolates etc as a centre piece.